Click here to take the Cat Coats Quiz! There are three basic types of hairs in a cat's coat: the guard hairs, the awn hairs, and the down hairs. Guard hairs are the outermost layer of the cat's coat and are helpful for insulation and the sense of touch. Awn hairs are the most prevalent hairs of the cat's fur that are medium in length. The down hairs are the short, soft hairs that make up the undercoat of a cat's fur. The six basic fur colors are white, black, red, brown, cream, and blue with the two primary color genes being red and black. All other colors are varieties of those colors except for solid white. White is considered a masking gene, covering up all other colors. A solid colored gene masks patterns as the white masks other colors. The most common cat pattern is tabby. A solid coat that is one color which has white roots is called a smoke, while a coat with colored tipping (often black) on a white background is known as silvering. Most cats with orange fur as a main color are male (75%). This is because the fur color gene is carried on the X chromosome. Males have one X chromosome. Therefore, if that one chromosome carries the orange fur gene, then the cat will have orange fur. Females, however, have 2 X chromosomes, so both would have to be orange for an orange cat. 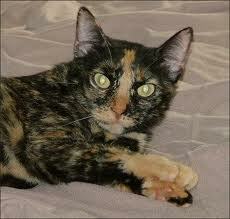 If only one X chromosome is orange, another color will be on the other gene resulting in a calico or tortoiseshell cat. Sixty-five to eighty-five percent of blue-eyed white cats are deaf. This is because the blue coloration of the eyes in a white cat is a product of the absence of a certain stem cell. Deafness is produced by the same cell being missing. Although it is often though that people are allergic to a cat's fur, this is not true. People are just allergic to the dried flakes of saliva mixed with the cat's dander left in the fur.